Type: BN-350 liquid metal fast breeder reactor (LMFBR), sodium coolant. "MPC&A Aspects of the BN-350 Nuclear Material Disposition Joint Action Team (JAT) Study," Partnership for Nuclear Security: United States/ Former Soviet Union Program of Cooperation on Nuclear Material Protection, Control, and Accounting, US Department of Energy, September 1998. Originally available on the DOE website, www.dp.doe.gov. A. Yu. Gagarinski, "Can Kazakhstan capitalise on its assets?" Nuclear Engineering International, December 1996, pp. 18-19. "Kazakhstan: BN-350 breeder shut permanently," Nucleonics Week, 24 June 1999, p. 16. Laurie Howles, "Load Factors to End March 1996," Nuclear Engineering, August 1996, pp. 12-13; See Fedor Ignatov, ITAR-TASS, 19 April 1993; in JPRS-TND-93-015, "Kazakhstan: Nuclear Reactor Shutdown Threatens Mangyshlak Peninsula," 28 May 1993, p. 28; A. Yu. Gagarinski, "Can Kazakhstan capitalise on its assets?" Nuclear Engineering International, December 1996, pp. 18-19. Juergen Kupitz, "Nuclear energy for seawater desalinization: Updating the record," IAEA Bulletin, www.iaea.or.at. World Nuclear Generating Capacity, Nukem, November 1996, p. 27. "World Nuclear Industry Handbook 1992," Nuclear Engineering International, p. 58. See William C. Potter, "An Overview of The Nuclear Potential of Select Non-Russian Soviet Successor States," unpublished paper presented to the Carnegie Endowment for International Peace, 20 August 1992, p. 2. V. Shmelev, "Estimation of The Quantities of Nuclear Materials at the Facilities in the New Independent States." US Department of Energy, "MPC&A Aspects of the BN-350 Nuclear Material Disposition Joint Action Team (JAT) Study," Partnership for Nuclear Security: United States/ Former Soviet Union Program of Cooperation on Nuclear Material Protection, Control, and Accounting, US Department of Energy, September 1998. Originally available on the DOE website, http://www.dp.doe.gov. "Kazakhstan Today," 26 October 2006, www.gazeta.kz. Emily Ewell, "International Conference on Nonproliferation Problems," NISNP trip report, September 1997, KAZ970900, p. 9. Nuexco Review, 1994, p. 50. "Kazakhstan," Nuclear Europe Worldscan, July-August 1995, p. 66. Albert Eras et al., "Department of Energy Nuclear Material Protection, Control, and Accounting Program at the Mangyshlak Atomic Energy Complex, Aktau, Republic of Kazakhstan," in Partnership For Nuclear Security: United States/Former Soviet Union Program of Cooperation on Nuclear Material Protection, Control, and Accounting (Washington, DC: Department of Energy, September 1998), pp. 249-254. CNS staff discussions with Kazakhstani nuclear officials, fall 1999, KAZ990900. "Safeguards Aspects of the Conditioning and Transfer of Irradiated Fuel in a Fast Breeder Reactor in Kazakhstan," U.S. Department of Energy, www.energy.gov. "MPC&A Aspects of the BN-350 Nuclear Material Disposition Joint Action Team (JAT) Study," Partnership for Nuclear Security: United States/ Former Soviet Union Program of Cooperation on Nuclear Material Protection, Control, and Accounting, US Department of Energy, September 1998. Originally available on www.dp.doe.gov. "U.S. Secretary Richardson Highlights Strong U.S.-Kazakhstan Economic Relationship: Expands Energy Cooperation; Announces Non-Proliferation Progress," US Department of Energy News, US DOE, www.energy.gov, 29 August 2000. "Argonne, other DOE labs team up to protect former Soviet nuclear materials," Argonne National Laboratory, http://www.anl.gov. "Commercial Overview of Kazakhstan: Appendix D—Selected Large or Recent U.S. Projects," Department of Commerce, www.bisnis.doc.gov. Emily Ewell Daughtry and Fred L. Wehling, "Cooperative Efforts to Secure Fissile Material in the NIS," The Nonproliferation Review, Spring 2000, Vol. 7, No. 1, p. 102. "Arms Control and Nonproliferation," Defense Nuclear Nonproliferation Executive Budget Summary FY 2001, DOE Chief Financial Officer, www.cfo.doe.gov, p. 48. Interfax-Kazakhstan, 22 September 2000; in "Kazakhstan searching for nuclear burial site as fast breeder reactor," FBIS Document CEP20000926000006. "DOE increases request for GTRI; some say larger boost needed," NuclearFuel, 12 February 2007, p. 6. In a jointoperation involving Kazatomprom and the Nuclear Threat Initiativethat began in 2001, 2,900 kg of 26% enriched nuclear fuel was transferred from Aktau to Ulba to be blended down to non-weapons usable forms of uranium for use in commercial and scientific activities. The project involved several steps: Nuclear workers in Aktau loaded onto rail cars fresh HEU fuel assemblies designed, but never used, for the BN-350 reactor. The fuel assemblies were transported Ulba, where security upgrades had been installed to permit HEU storage. A blend-down line and additional security upgrades to allow HEU processing were designed, licensed, and installed at Ulba to carry out the operations. Costs of the project, approximately $2 million, were shared equally between NTI and Kazatomprom. The IAEA applied safeguards during transport, commissioning, and downblending. The facilities constructed at Ulba to blend down the BN-350 HEU fuel will remain operation and could be used in the future to eliminate other weapons-usable uranium. Source: "Government of Kazakhstan and NTI Mark Success of HEU Blend-down Project; Material Could Have Been Used to Make up to Two Dozen Nuclear Bombs," NTI press release, 8 October 2005. U.S.-Kazakhstani negotiations on the fate of the BN-350 plutonium-laden spent fuel have stalled, raising concerns that the material, which continues to cool, may be vulnerable to theft, in spite of increased security and safeguards at the site. According to press reports, the Kazakhstani government wants to transfer the material to a storage site yet to be constructed at the former Semipalatinsk Test Site. The United States reportedly wants the spent fuel shipped to existing secure facilities in Russia. Source: Burt Herman, Bakhila Bukharbayeva, "AP Enterprise: US-Kazakh talks on leftover plutonium stall; some see risk," Associated Press, 29 August 2004; Lexis-Nexis Academic Universe, www.lexis-nexis.com. An article in the May 2003 issue of Science reports that Kazakhstani and US officials are about to make an $80 million deal to transfer 3 metric tons (t) of "ivory grade" plutonium, containing more than 90% Pu-239, from Aktau to Semipalatinsk.The plutonium comes from the BN-350 breeder reactor at the Mangyshlak Atomic Energy Combine (MAEK) and is contained in 300t of highly radioactive spent fuel. During the transportation procedure, which is likely to start in 2004 and continue until 2007, the spent fuel will be loaded into specially-manufactured containers and shipped by rail to the Semipalatinsk Test Site. According to Timur Zhantikin, chairman of the Kazakhstani Atomic Energy Committee, the spent fuel will be stored in underground silos at the Baykal-1 reactor complex. Source: Richard Stone, "Save Haven for a Breeder's Plutonium Hoard," Science, Vol.300, 23 May 2003, pg. 1224. Interfax, 30 April 2003; BBC Worldwide Monitoring; in "Kazakhstan's only atomic plant sold for less than 1m dollars," Lexis-Nexis Academic Universe, http://web.lexis-nexis.com. Kazakhstan Today; in "The Concept of Further Development Will Be Elaborated at MAEC-Kazatomprom LLC - Kazakhstan Today," 6 May 2003, National Atomic Energy Company KazAtomProm, www.katatomprom.kz/eng. On 11 February 2003, Interfax reported that, according to Kazakhstani National Nuclear Center Deputy Director Irina Tazhibayeva, Kazakhstan will submit a plan to mothball the BN-350 reactor to the International Atomic Energy Agency (IAEA) in March 2003. The IAEA will consider the plan within 2-3 months of submission and provide recommendations to Kazakhstan regarding the final decision. Tazhibayeva noted that after its approval, the plan will be presented to a conference of donor-states to attract funding. This aid will supplement the material and technical assistance already provided by the United States, Japan, and the European Union's Technical Assistance to the CIS program. (For more information, see Kazakhstan:Foreign Assistance Overview.) As of February 2003, $40 million has been spent on the project. The estimated total cost of the project is $300 million. 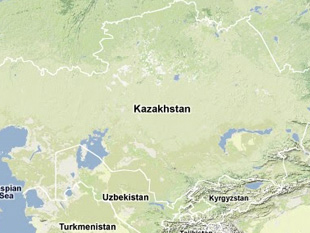 Source: "Kazakhstan v marte predstavit v MAGATE plan vyvoda iz stroya atomnogo reaktora," Interfax, 11 February 2003. "V Kazakhstane priznan bankrotom atomnyy energokombinat," Interfax, 17 January 2003. "Move underway to declare Kazakhstan's only nuclear power plant bankrupt," Interfax, 5 January 2003; FBIS Document CEP20030105000144. "V Kazakhstane bankrotyat yedinstvennyy v strane atomnyy energeticheskiy kombinat," Interfax, 5 January 2003. "'Kazatomprom' yavlyayetsya naiboleye veroyatnym pretendentom na pokupku MAEK," Interfax, 5 January 2003. According to Petr Nazarenko, MAEK's technical director, Kazakhstan plans to remove all radioactive sodium coolant from its BN-350 reactor by June 2003, after which the reactor will be mothballed. As of April 2002, about 1,000 tons of radioactive sodium was circulating in the reactor. Approximately $2 million per year is required to maintain the reactor, according to Nazarenko. Source: "Kazakhstani nuclear reactor to be closed off by June 2003," Interfax-Kazakhstan, 10 April 2002 in FBIS Document CEP20020410000251. According to Douglas Newton, project manager of the Kazakhstan Breeder Reactor Closure Project, the US Department of Energy and Department of State are still working with the Kazakhstani government on several long-term storage options for BN-350's ivory-grade plutonium. This is in spite of announcements from Kazakhstani officials of their intention to store the plutonium in northeastern Kazakhstan. Some experts believe that the best place for Aktau's plutonium is Russia. For more information, please see the 8/29/2000 entry, below. Source: Nikola Krastev, "Kazakhstan: Experts Report Progress on Safeguarding Nuclear Site," RFE/RL, 12 December 2001; in RANSAC Nuclear News, 14 December 2001, www.ransac.org. According to Vladimir Karaulov, director of the BN-350 Fast Breeder Reactor, the reactor is in the final stage of decommissioning. The radioactive sodium coolant will be decontaminated of cesium in 2002 and drained in 2003. The coolant will be converted to caustic soda by 2006. After this process is complete, the reactor will be mothballed for 50 years. At that time decisions about final dismantlement of the reactor site will be made. Source: "Atomnaya energiya: bolshaya peresmenka," Kazakhstanskaya pravda, 19 October 2001, www.kazpravda.kz. On 12 July 2001 MAEK hosted a ceremony marking the completion of the packaging of spent fuel at the BN-350 nuclear reactor in Aktau. The ceremony was attended by representatives of the National Nuclear Center of the Republic of Kazakhstan, the International Atomic Energy Agency, US national laboratories, and the US Embassy in Kazakhstan. During the two-and-a-half year packaging process, 3,000 spent fuel assemblies were stabilized and packaged into 478 canisters and then placed into a cooling pond with an IAEA seal. The cost of unloading and packaging the spent fuel amounted to $40 million. Source: "All spent fuel removed from nuclear reactor in eastern Kazakhstan," Interfax, 12 July 2001 in FBIS Document CEP20010713000295. Shamil Tukhvatulin, director of the National Nuclear Center of Kazakhstan, announced that the total cost for long-term storage of spent nuclear fuel from the BN-350 fast breeder reactor will amount to $20-40 million. According to Tukhvatulin, the spent fuel will be transported to the former Semipalatinsk Test Site for long-term storage. Source: "Kazakhstan. Zakhoroneniye OYaT reaktora BN-350 oboydetsya v 20-40 mln dollarov," Byulleten po Atomnoy Energetike, July 2001, Interfax, 6 June 2001. On 9 April 2001 the US Department of Energy released its FY 2002 budget request, in which $8.9 million was requested for the Spent Fuel Initiative in Kazakhstan. This is a 40% decrease from the FY 2001 allocation of $15.8 million. The FY 2002 budget request states that the reduced level reflects the "stretch out of completion," presumably referring to delays in selecting a long-term storage site for the plutonium. For more information, see the developments from 24 November 2000 and 20 December 1999. Source: US Department of Energy, "Budget Highlights: Fiscal Year 2002 Budget Request," Department of Energy, www.energy.gov, p. 50. Boris Kuzmenko, "Pervaya polosa. Yadernoye serdtse Mangyshlaka ostanovitsya," Vremya MN, No. 203, 29 November 2000; in Eastview Publications Online Databases of Russian Publications, http://news.mosinfo.ru. "Kazakhstan to Store Spent Nuclear Fuel from BN-350 Reactor at Semipalatinsk Range," Interfax, 24 November 2000. On 28-29 August 2000, US Secretary of Energy Bill Richardson held meetings with Kazakhstani President Nazarbayev and Minister of Energy, Industry, and Trade Shkolnik. Richardson announced that the joint US-Kazakhstan project to package weapons-grade plutonium at MAEK is 85% complete, with over 2.5 tons of "ivory grade" plutonium, or 2,800 fuel assemblies, secured. MAEK contains a total of 3 tons of "ivory grade" plutonium contained in approximately 300 metric tons of spent fuel. Ivory-grade plutonium is plutonium with an even lower percentage of undesirable isotopes than typical weapons-grade plutonium. Upon completion of the packaging project, anticipated for February 2001, the United States and Kazakhstan will proceed with plans for long-term storage and disposition of the fuel. Richardson reported that thus far, the United States has budgeted $3.8 million to support efforts to safely shut down the BN-350 reactor as part of a December 1999 US-Kazakhstan agreement. Richardson also announced that DOE's Initiatives for Proliferation Prevention project will award up to $4 million to nine Kazakhstani institutes to create employment opportunities for scientists with expertise in weapons of mass destruction. "U.S. Secretary Richardson Highlights Strong U.S.-Kazakhstan Economic Relationship: Expands Energy Cooperation; Announces Non-Proliferation Progress," US Department of Energy News, U.S. DOE, www.energy.gov, 29 August 2000. Matthew Bunn, "The Next Wave: Urgently Needed New Steps to Control Warheads and Fissile Material," (Washington DC and Cambridge, MA: The Carnegie Non-Proliferation Project and the Harvard Project on Managing the Atom, March 2000), p. 39. According to a 7 February 2000 federal budget request, the US Department of Energy allocated $15.5 million for FY2000 and requested $16 million for 2001 for the BN-350 reactor decommissioning project in Kazakhstan. Source: William Hoehn, "Department of Energy FY2001 Budget Requests in the Expanded Threat Reduction Initiative," The Clinton Administration's Fiscal Year 2001 Budget Requests for Nuclear Security Cooperation with Russia, www.ransac.org. According to a 28 February 2000 report on Kazakhstan's Khabar Television, the unloading of the nuclear fuel at the BN-350 nuclear reactor has begun. KATEP's Department for Decommissioning is responsible for coordinating this work. Sources: Khabar TV broadcast, Almaty, 28 February 2000; in "Unloading Fuel Begins at Kazakh Nuclear Power Plant," FBIS Central Asia Monitoring Unit, 28 February 2000. According to a 4 February 2000 report, Kazakhstani Minister of Energy Vladimir Shkolnik announced that the schedule for decommissioning the BN-350 nuclear reactor will be developed by September 2000. Shkolnik also mentioned that an international conference regarding this issue will be conducted in May 2000. Sources: "Plan po vyvedeniyu iz ekspluatatsii yadernogo reaktora BN-350 budet razrabotan k sentyabryu,"Panorama, 4 February 2000, p.10. "V Astane obsuzhdayutsya voprosy kazakhstansko-amerikanskogo partnerstva programmy SUU," Vremya PO, www.globe.kz, No. 6, 28 January 2000, p. 1. Nadezhda Shashkova, "Kogda doveriye nuzhneye deneg," Kazakhstanskaya Pravda, www.kazpravda.kz, No. 26, 1 February 2000, p. 2. US Secretary of Energy William Richardson and Kazakhstani Minister of Energy Vladimir Shkolnik signed an agreement to close and decommission the BN-350 reactor in Aktau at the US-Kazakhstani Bilateral Commission meeting on 20 December 1999 in Washington, DC. Secretary Richardson announced that a joint US-Kazakhstani expert group will launch a study of the long-term storage options for spent fuel currently stored at the site. Sources: "Kazakhstan Reactor D&D plan OK'd by Bilateral Commission," Nuclear Weapons & Materials Monitor, 10 January 2000, p. 6. Khabar TV broadcast, Almaty, 12 June 1999; in "Kazakhs start mothballing nuclear power station in west," BBC Monitoring Central Asia Unit, 13 June 1999. "Fast Breeder Closes," Nuclear Engineering International, Vol.44, No.541, August 1999, p.4. Director of the Moscow Center of the World Association of Nuclear Operators Farit Tukhvetov said that the BN-350 reactor at Aktau was officially shut down on 22 April 1999. According to Tukhvetov, Kazakhstani authorities decided that the reactor was too isolated from technical support and design organizations in Russia. Source: "Kazakhstan: BN-350 breeder shut permanently," Nucleonics Week, 24 June 1999, p. 16. According to a report published on 15 October 1998, Kazakhstani Minister of Science Vladimir Shkolnik said that the BN-350 reactor at Aktau will resume operations in November 1998 after a repair outage and will continue to generate weapons-grade plutonium in its depleted uranium blanket for several years. Because the reactor is expected to shut down before 2005, the cost of converting the reactor's blanket to a non-fertile material like iron was not considered justifiable. The spent fuel stored in pools at the reactor site contain between two and three MT of weapons-grade plutonium produced at the reactor. Kazakhstan continues negotiations with US and European industry and governments over long-term storage options for spent fuel from Aktau, and a decision on waste disposition is expected in 1999. Source: Mark Hibbs, "Kazakhs Decide Aktau Will Continue to Run as Breeder Till Shutdown," Nucleonics Week, 15 October 1998, p. 9. According to a paper presented at a conference in Kurchatov on 14 September 1998, Japan has provided technical support for MPC&A at the BN-350 reactor facility at Aktau. The Japanese firm PENSCO Co. Ltd, with technical cooperation from the Power Reactor and Nuclear Development Corporation (PNC), has provided a flow monitoring system (including a neutron detector, gamma detector, and personal computers) for monitoring the removal of fuel from the reactor core, along with other equipment for use in IAEA inspections. PENSCO also supplied software, personal computers, and local area network hardware for Aktau's material accounting and control system, including a program for calculating fuel composition and burn-up. Japan and the United states coordinated their support for physical protection at Aktau, including provision of identity card readers, turnstiles, metal detectors, x-ray detectors, and a TV monitoring system. Similar physical protection support was also provided to the Kazakhstan Atomic Energy Agency and Kazakhstan's Institute of Atomic Energy. Source: Y. Hashimoto et al, "Support to the Physical Protection and Accountancy for Nuclear Materials in Kazakhstan." Paper presented at the 2nd International Conference on Non-Proliferation Problems, Kurchatov, Kazakhstan, 14-17 September 1998. According to Timur Zhantikin, Director of the Kazakhstan Atomic Energy Agency, more than 3MT of nuclear waste from the BN-350 reactor at Aktau will be transported from the reactor to the burial site at Semipalatinsk starting in November 1998. US experts have been closely involved in the waste transport project, and high-tech storage containers and transport equipment will be paid for with US funds, according to a November 1998 agreement signed by the United States and Kazakhstan. The waste, which includes plutonium and other weapons-usable material, will be moved over a distance of 2,500km, but the exact route and mode of transportation have not been determined. Source: Mike Collet-White, "Kazakhs to Move Huge Nuclear Waste Stock," Reuters, 11 September 1998; in Inquisit Agent Report, www.inquisit.com. "Ageing Kazakh Nuclear Reactor To Be Decommissioned," BBC Central Asia, 29 August 1998; in Inquisit Agent Report, www.inquisit.com. Mike Collet-White, "Kazakhs to Move Huge Nuclear Waste Stock," Reuters, 11 September 1998; in Inquisit Agent Report, www.inquisit.com. The Office of Arms Control and Nonproliferation of the United States Department of Energy will spend $10 million in FY 1998 (plus $2 million from the State Department's Nonproliferation and Disarmament Fund), and has asked for budget authority to spend $15 million in FY 1999, for the containment and interim storage of spent breeder blanket fuel from the BN-350 reactor at Aktau. The spent fuel, now stored at the Aktau site, will be transported to the Semipalatinsk complex for long-term storage under IAEA safeguards. The blanket fuel management program comes under the agenda of the US-Kazakhstan Joint Commission set up by US Vice President Albert Gore and Kazakhstani President Nursultan Nazarbayev. Talks have reportedly been held with potential vendors of casks for spent fuel storage, including the German firms GNB, GNS, and Nukem, though GNB's potential role in the project was linked to pending commitments by the German government to provide additional financing. Kazakhstani Minister of Science Vladimir Shkolnik said that the infrastructure for spent fuel storage at Semipalatinsk would cost an estimated $20 million. Source: "U.S. will spend $27 million in FY-98, FY-99 to manage BN-350 plutonium," NuclearFuel, 9 February 1998, pp. 4-5. The United States Department of Energy (DOE) has provided nondestructive assay techniques and systems to upgrade material protection, control, and accounting (MPC&A) at the BN-350 fast breeder reactor at Aktau. The Aktau plant has received approximately 75 percent of a monitoring system designed to sense radiation from and track the movement of nuclear material. Complete insallation and comprehensive follow-up will be required to fully optimize the system. The BN-350 reactor has received gamma-ray measurement systems, and staff have received initial training on these systems. The design for a neutron assay system for spent fuel from BN-350 is underway at Los Alamos National Laboratory and should be installed by summer 1998. The new systems require calibration materials, which will be provided by New Brunswick Laboratory after Kazakhstani regulatory approval. Source: J.K. Sprinkle et al., "Application of Nondestructive Assay Techniques in Kazakhstan," paper presented at the Institute of Nuclear Materials Management 38th Annual Meeting, Phoenix, Arizona, 20-24 July 1997. The Mazhilis (lower chamber of the Kazakhstani parliament) approved the draft law On the Use of Atomic Energy. The draft law, presented by Kazakhstani Minister of Science and President of the Academy of Sciences Vladimir Shkolnik stipulates the responsibilities of state bodies in the use of nuclear energy, provisions for the non-proliferation of nuclear weapons, and regulations for the storage and processing of nuclear waste. The draft allows for any form of private ownership of nuclear power generating facilities and proposes to conduct state regulation of the use of nuclear energy by introducing a licensing system; this last proposal caused parliamentary debates. Some deputies felt that abolishing the former state monopoly over nuclear energy facilities and transferring them to private ownership will endanger their safety. Source: Tatyana Abramenko, "Odobrennyy mazhilisom zakonoproekt 'Ob ispolzovanii atomnoy energii' mozhet polozhit konets gosudarstvennoy monopolii v etoy oblasti," Panorama, 24 January 1997, p. 3. The average load factor of the BN-350 FBR in Aktau for electricity generation over a 12-month period until the end of 3/96 was 4.1 percent. The lifetime load factor from the first grid connection (7/16/73) to the end of 3/96 was 23.7 percent. In 1995, the BN-350 provided 800,000 MWh of electricity, equivalent to a nuclear share of 0.13 percent with an average load factor of 20 percent. Source: Laurie Howles," Load Factors to End March 1996," Nuclear Engineering, August 1996, pp. 12-13; Nukem, November 1996, p. 27. An international conference was held in Aktau concerning the development of nuclear energy in Kazakhstan. The organizational committee of the conference in Aktau was headed by Kazakhstani Minister of Science and President of the Academy of Sciences Vladimir Shkolnik, and President of Russia's Kurchatov Institute Yevgeniy Velikhov. The Kazakhstani government invited representatives of large international manufacturers of nuclear reactors, hoping to attract them to bid on the construction of a new nuclear plant in Kazakhstan. Kazakhstani officials expect the US firm General Atomics, along with companies from Canada and France, to be the leading contenders in the contract bidding process. In addition to the plan to build a nuclear reactor at the former Semipalatinsk military site, the government is considering constructing a two-unit plant in Southern Kazakhstan by the year 2010 and replacing the aging BN-350 FBR in Aktau with a Russian BNM-170 modular fast reactor by the year 2005. In addition, projects for nuclear heat plants are being considered for Western Kazakhstan and the cities of Karaganda, Petropavlovsk, and Leninsk. A Russian-design VVER-640 reactor is one option for a future reactor. However, local experts have expressed interest in a Canadian CANDU reactor (Canadian-Deuterium Uranium heavy water reactor) because of its safety standards as well as its use of unenriched uranium. Total nuclear generation capacity by the year 2030 is planned at about 4-5 GW. Viktor Zhuravlev, "Shag k mezhdunarodnoy kooperatsii v mirnom ispolzovanii atoma,"Kazakhstanskaya pravda, 25 June 1996. "Nuclear Power Conferences In June, October In Kazakhstan," Post -Soviet Nuclear and Defense Monitor, 12 March 1996, p. 4. Olga Kovalenko, "Bez atomnoy elektrostantsii Kazakhstanu ne oboytis," Kazakhstanskaya pravda, 6 July 1996, p. 3. Mikhail Ustiugov, "Kazakh Power Play," The Bulletin of Atomic Scientists, July-August 1996, pp. 45-49. The IAEA conducted a seminar on the International Nuclear Events Scale (INES) at the Kazakhstani Atomic Energy Agency during June 1996. INES is used for reporting accidents at civilian atomic energy facilities and during the transportation of radioactive materials. Kazakhstan, as a member of the IAEA, joined the INES scale in 1995. Source: Panorama, "Na seminare v Agentstve po atomnoy energii sostoyalas prezentatsiya Mezhdunarodnoy shkaly yadernykh sobytiy," No.24, 21 June 1996, p. 9. It was reported that delegates from Armenia, Belarus, Kazakhstan, Russia, Tajikistan, and Ukraine approved a plan for cooperation on the peaceful uses of nuclear energy during their meeting in Minsk. The plan covers nuclear power development, spent fuel and radioactive waste management, the fuel cycle, safety assurance, and the use of radiation technologies in medicine and agriculture. Source: Nucnet, "CIS Accord on Nuclear Energy Links," News No.277-80, 30 May 1996, p. 10. An IAEA technical group conducted a session on fast-neutron reactors in Aktau during May 1996 at the invitation of the former Director of the Mangystau Atomic Energy Combine and now Akim (Head) of the Mangystau Oblast, Vyacheslav Levitin. Source: Raisa Dobraya, "Atomshchiki sobralis v Aktau," Kazakhstanskaya pravda, 28 May 1996, p. 2. On 1/5/96, the BN-350 came back on-line after an eight month period of upgrading. Two minor events related to coolant pumps occurred shortly after bringing the reactor on-line. Both events measured at Level 0 on the International Nuclear Event Scale, since safety mechanisms were fully operable at all times. Source: "Kazakhstan's BN-350 Hits Minor Roadblocks in Return to Power," Nucleonics Week, 15 February 1996, p. 6. An editorial prepared by professors Zhabaga Takibayev and Yuriy Cherepnin builds a case for the continued development of the Kazakhstani nuclear energy industry. The authors reiterate the short-sightedness of relying on coal as a source of energy and cite an increasing level of electric energy imports to support the need for a more forward-looking program of nuclear energy development. According to the authors, if Kazakhstan began seriously producing nuclear energy in 1996, by the year 2000 energy output would again reach 1993 levels. Another factor compounding the need for nuclear energy development is competition from abroad, especially from countries redoubling their efforts to enlarge nuclear energy output such as Russia and China. Failure to seize opportunities in nuclear energy may lead to domestic unemployment and the inability of the Kazakhstani energy industry to compete on the world market in the future. Source: Zhabaga Takibayev and Yuriy Cherepnin, "Atomic Energy and Economics of the Country, "Kazakhstanskaya pravda, 27 December 1995, p. 2. Minatom researchers have modeled a 170 MW BNM-170 fast breeder reactor to replace the aging BN-350 reactor in Aktau. According to researchers, upgrading the BN-350 would likely increase the reactors life span only until 2003. Kazak officials also stated in summer 1995 that the construction of a new commercial reactor at Semipalatinsk is planned. Source: "Data Features: World Nuclear Generation Capacity 1993/94," Nukem Market Report, December 1995, p. 35. Zhenis Sadykov, Chairman of the Nevada-Semipalatinsk Problem-Solving Scientific Committee, stated that, "an alarming situation has arisen in Aktau." According to Sadykov, the power station is at the end of its service life and its urgent modernization is essential. Otherwise, the city will be without water or, "there could be a nuclear explosion similar to Chernobyl." Source: FBIS-SOV-95-091, "Problem Committee Officer on Atomic Energy," 6 May 1995. Extended parliamentary hearings dedicated to the problems and the future of the nuclear scientific and industrial complex in the Republic of Kazakhstan were held on 31 January 1995. The heads of relevant ministries and departments were invited to the hearings. According to Vladimir Shkolnik, the Minister of Science and New Technologies, there are two ideas for the development of nuclear power in the Republic of Kazakhstan. One program plans to put 18-20 GW of nuclear capacity in operation by the year 2003, the other program envisages only 4-6 GW. Summing up the parliamentary hearings, participants agreed that it was necessary to create a single concept for the development of Kazakhstan's nuclear power industry. Source: Panorama, 4 February 1995, p. 2; in "Parliament Considers Future of Nuclear Power," FBIS-SOV-95-028, 4 February 1995. "Fire At Kazak Nuclear Power Plant," OMRI Daily Digest, 3 February 1995. BBC Monitoring Summary of World Broadcast, 11 February 1995; in UI News Briefing, July 1995, p.2. Nuclear News, March 1995, p.18, 51. Kazakhstan did not attend an IAEA-sponsored nuclear safety convention in Vienna. More than eighty countries attended the conference and signed what critics have called an unenforceable agreement that technically requires countries to shut down unsafe and/or obsolete reactors. The only signatories from those new independent republics that have commercial reactors are Russia and Ukraine. Armenia and Lithuania, the two others besides Kazakhstan, also did not attend. The treaty will only come into force after 22 countries deposit instruments of ratification; 17 of which must operate commercial reactors. Source: Jan Kramar, "Over 80 Nations Adopt Nuclear Safety Convention," Reuters, 17 June 1994. Ostankino Television, 28 June 1994; in "Fast-Breeder Rector Closed For Lack of Money," FBIS-SOV-94-125, 29 June 1994, p. 54. CISNP Interviews with Dr. Vladimir S. Shkolnik, Minister of Science and Technology, 19 August 1994 and 16 April 1994, Monterey, CA. "A Lack of Money Has Shut Down Kazakhstan's BN-350," Nuclear News, August 1994, p. 47. A Kazakhstani delegate to a conference of nuclear scientists and engineers at Obninsk, Russia, stated that Kazakhstan would be ready to put a new, large-scale reactor into operation by the year 2005. Source: "Ukraine Protests Against West's Calls for Chernobyl Shut-down," ENS NucNet, 30 June 1994. According to a Kazakhstani governmental report, 15 million tenge have been set aside for a project on replacing the aging FBR at Aktau with a newer model FBR. Russian and Kazakhstani specialists have yet to agree on a design of the new reactor. Source: ITAR-TASS, 6 April 1994; in JPRS-TND-94-010, "State Plans To Build Second Fast-Neutron Reactors," 5 May 1994, p. 37. Interruptions in the flow of payments between Kazakhstan and Russia are threatening the operation of the FBR at Aktau, according to an open letter submitted to the presidents of both countries by personnel of the nuclear plant. Urgent aid is requested to prevent a shutdown of the plant, which would have a paralyzing effect on industry and cities on the Mangyshlak peninsula. According to this report, there are no plans in place for the safe shutdown of the reactor. Source: ITAR-TASS 4/5/94; in "Nuclear Plant Appeals to Nazarbayev, Yeltsin for Aid," FBIS-SOV-94-066, 6 April 1994, p. 45. Russia's Minatom has offered to work with the KAEA on ways to prolong the life of the BN-350 for up to ten years, and to replace it with an advanced FBR design, the Module Breeder Reactor BMN-170. Minatom suggests that this new design could use much of the existing BN-350's equipment and would adequately replace its generating capacity. "Longer Life For Pioneer Fast Breeder In Kazakhstan?" ENS NucNet, 17 February 1994. Mark Hibbs, "Russian Industry Seeks Pact For Kazakhstan FBR Complex," Nucleonics Week, 16 December 1994, pp. 14-15. Vladimir Shkolnik, Nuclear Europe Worldscan, July-august 1994, p. 57. Russian nuclear officials have proposed the creation of an "integrated fast reactor complex" at Aktau, to include a reprocessing facility. Kazakhstan, however, does not want Aktau to become a center for disposal of the plutonium from ex-Soviet weapons. Source: Nucleonics Week, 16 December 1993, pp. 14-15. The nuclear reactor at Aktau has experienced severe financial and personnel problems. There are reports of an exodus of Russian specialists from the plant and of difficulties in obtaining fuel due to the plant's failure to pay for prior deliveries. These problems pose safety risks and could necessitate closure of the plant. Source: Fedor Ignatov, ITAR-TASS, 19 April 1993; in "Kazakhstan: Nuclear Reactor Shutdown Threatens Mangyshlak Peninsula," JPRS-TND-93-015, 28 May 1993, p. 28.